Cryptocurrency exchange is a hot business nowadays. And given the meteoric rise of Bitcoin and altcoins last year, this was expected to say the least. But as you know, running a crypto exchange is not an easy business to be in. Moreover, being centralized in nature, these exchanges are prone to numerous attacks and hacks. However, in all the hullabaloo, some exchanges have left a positive mark on the crypto space. And one of them is Bitfinex Exchange. Biftinex is the world’s largest and most advanced cryptocurrency trading platform operating since 2013 in this space. It is based out of Hong Kong and serves almost every country in the world (except for few which we are going to reveal further in this article). For quite some time, it has been the busiest exchange in the world that was pulling the most USD/BTC volume and still ranks number one in this aspect. Still thinking why to use Bitfinex? Well, it is because apart from trading BTC, it also trades numerous other altcoins and is a popular multi-coin exchange of the cryptosphere. 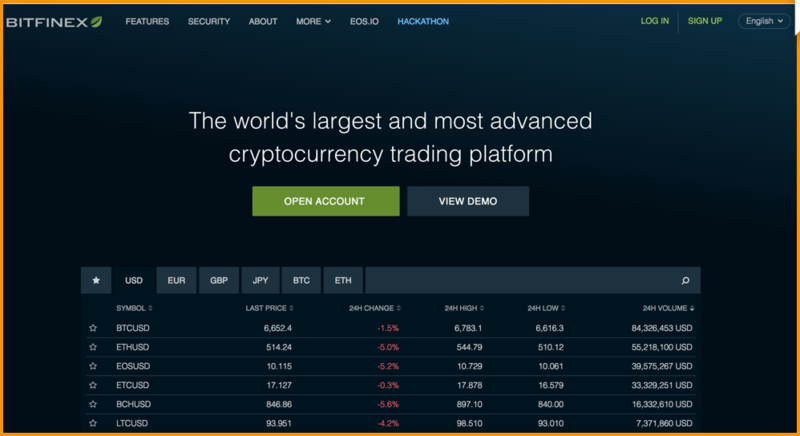 It also maintains order books and facilitates P2P trading for an exchange fee. The specifics of the same will be discussed later in this article. 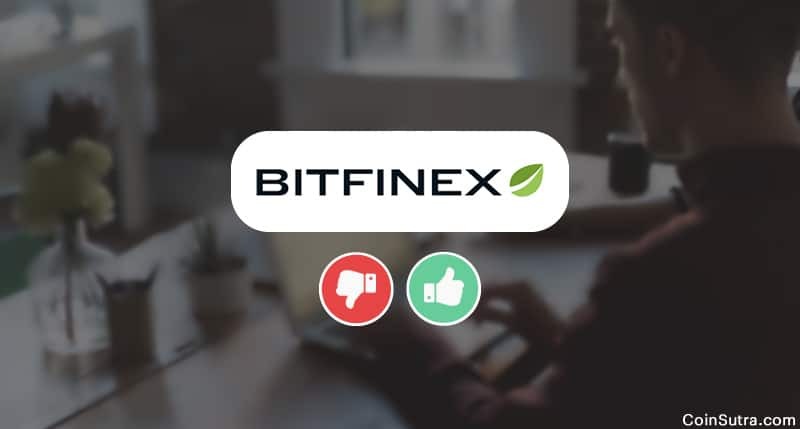 Bitfinex is a multi-coin exchange and has many advanced features that a newbie might not require when starting cryptocurrency trading. In this section, I will highlight some of the features and facilities that Bitfinex provides. The buy/sell walls are clearly visible in the order book. From here, you can select the deal that attracts you. But you can place and complete your order only when you have a verified & approved account. On the first look, I found their UI somewhat cluttered, but you can dig through and find the relevant options for yourself. It’s just that you have to look with intent. The one thing I liked about the Bitfinex dashboard is that you can customize it to make your own unique workstation to some extent which is a cool feature in my opinion and is not available on any other exchange yet. Bitfinex supports a wide range of cryptocurrencies. As of now, there are over 75 cryptocurrencies/pairs listed on it. Amongst which, you will find popular cryptocurrencies like BTC, BCH, LTC, ETH, XMR, and LTC, etc. and numerous other popular ERC20 tokens. Bitfinex also supports fiat currencies such as USD, EUR, GBP, JPY which can be used to trade many cryptocurrencies against fiat pairs. Note: As of now, fiat deposits are blocked until further notice. Note: Margin trading is not the same as listed above. Bitfinex serves all countries except the United States, Bosnia and Herzegovina, Democratic People’s Republic of Korea (North Korea), Ethiopia, Iran, Iraq, Syria, Uganda, Vanuatu, and Yemen. Bitfinex also allows you to margin trade and get leverage of up to 3.33X. Let us assume you have USD 1000 in your margin wallet. That 1000 USD will serve as collateral for opening margin positions up to 3.33:1, i.e., a margin position with a USD value up to 3333.33 USD can be opened. One can borrow USD or BTC on Bitfinex for margin trading. Here is the feed overview for margin trading on Bitfinex. Bitfinex help center has many commonly asked questions and answers in their knowledge base. So you can use that to troubleshoot your issues. But if you are unable to find answers here, you can always drop an email to [email protected] to submit a new help desk ticket. As if all this was not enough! Bitfinex also provides cool mobile apps for both iOS and Android users. One can deposit and withdraw cryptocurrencies and fiat through it and trade other crypto pairs. I find a mobile app easier to exchange and trade cryptocurrencies even if we are not in front of our computer. So it is good to have mobile apps for Bitfinex too (Download Bitfinex Android app | Download Bitfinex iOS app). 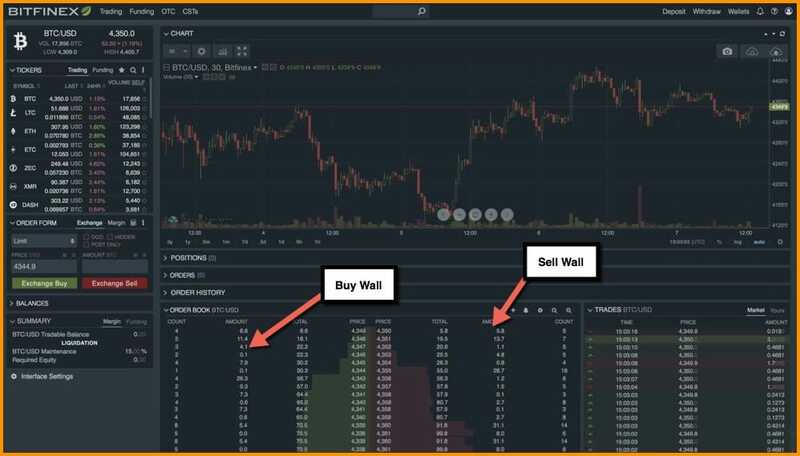 You also get features such as limit orders, stop orders, trailing stop, fill or kill, TWAP, and others, along with different market charts for various intervals. Last but not the least, Trading View powers Bitfinex’s charts so you can enjoy a complete suite of tools to draw, annotation, download and share your charts. Unfortunately, Bitfinex has had a controversial existence so far. Bitfinex was hacked in August 2016 and lost 120,000 BTCs. It happened because attackers were able to exploit a vulnerability in the multisig wallet architecture of Bitfinex and BitGo. They have recently upgraded their security architecture, a post which there have been no hacks/attacks on this exchange. Another controversy Bitfinex is associated with is that of USDT (Tether). Tether, a crypto company owned by Bitfinex, has been accused of printing digital fiat USDT token. And it is believed that Bitfinex is using this to pump and dump crypto markets artificially. Before we go any further, let me tell you Bitfinex is not for beginners or newbies. It is for professionals and intermediate traders who satisfy specific criteria. Plus, they have certain barriers to entry that makes it difficult for a newcomer to start with which has been politely highlighted on their exchange too. PROFESSIONAL PLATFORM: Bitfinex is a platform for professional traders. If you are new to cryptocurrency trading, please consider another, more straightforward platform first and return to Bitfinex later. MINIMUM ACCOUNT EQUITY: New accounts will not be able to trade or perform any platform function until they reach minimum account equity of USD 10,000, achieved by depositing cryptocurrency. VERIFICATION TIMELINE: If you wish to complete the verification process to gain access to additional features such as fiat deposits and withdrawals, please understand that the verification process is significantly backlogged. New verification requests are taking 6-8 weeks to complete. INACTIVITY FEE: Bitfinex is not a wallet service. If you are not participating in Bitfinex markets, please withdraw your funds from the platform. In the future, users who hold balances in their Bitfinex account but do not participate in markets may be charged a small inactivity fee. Only after accepting these conditions can one initiate the process to open an account on Bitfinex. 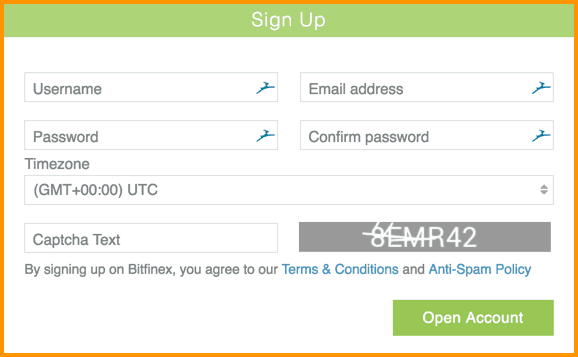 For getting started on Bitfinex, you need to accept all the conditions mentioned above and get started by signing-up using your email ID and other details. Can You Trust Bitfinex? Is It Safe? Of course, one can trust Biffinex for trading given its track record. But like I said, it is not for everyone. Plus, you need to stay on guard against using their inbuilt wallet as your permanent wallet because hacks like August 2016 can happen anytime and nothing is full proof in crypto. They have taken their security game to another level since the hack and have also repaid the customers who lost their money but you should not take chances. Always store your coins in Ledger Nano S-like device. I used Bitfinex in my early crypto days when the UI was simple, and there were no minimum limits to get started on it. Now time to hear from you: Which exchange do you use? Have you used Bitfinex yet? If you have, do share your experience with us in the comments below. 1.2 Can You Trust Bitfinex? Is It Safe? Beware that after all the work you put in to get verified they tell you that you can’t make EUR SEPA payments to online e-money banks such as monese, revolut and others. Their compliance won’t allow. I don’t understand why the score is so low. Yes, Bitfinex has “features” and Yes probably it is not for everyone, but in general it is a good exchange. One of the biggest. And if you remember how they solved the problem of hacking in 2016, then almost the most honest.